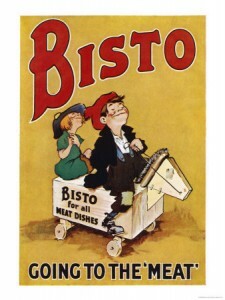 The very first Bisto product, in 1908, was a meat-flavoured gravy powder, which rapidly became a bestseller in the UK. It was added to gravies to give a richer taste and aroma. Invented by Messrs Roberts & Patterson, it was named “Bisto” because it “Browns, Seasons and Thickens in One”. Naming of the Bisto twins? In Birmingham in the 1930s a competition was held to put a name to the two Bisto twin characters,a boy and a girl sniffing the beautiful aroma of Bisto’s gravy. The competition was won by Mr and Mrs Simmonds,who named the twins after themselves…they called them Bill and Maree. They were awarded a beautiful china doll. Bisto Granules were introduced in 1979. The granules dissolve in hot water to form a gravy substitute. This product capitalised on the growing preference among British consumers for foods (or food substitutes) that can be quickly and conveniently prepared. As of 2005, Bisto Gravy Granules dominate the British market, with a share in excess of 70%. Every UK grocery outlet is likely to have a Bisto product on its shelf.